Lofoten has a great selection of activities, but it may be difficult to prioritise what you should do if you have limited time available. To make it easier to choose, we've compiled a list of the top 10 things to do in Lofoten with help from our local experts and employees. We have hotels in both Solvaer and Leknes, which are great starting points to explore the world’s most beautiful archipelago of islands – just like the locals do. Here are 2 tips in one! Haukland beach offers incredible views and is one of the most popular attractions in Lofoten, and for good reason! The beach is covered in white sand and has turquoise blue water, nested below dramatic mountain peaks along the shoreline. "If you're looking to see Haukland from above, I recommend hiking to Mount Mannen. It takes about 30 to 60 minutes and offers some of the most stunning views of Lofoten. If you have to pick one hiking trip, this is the one," says Sylvi! Mount Mannen divides the Haukland and Uttakleiv beaches. The best place for a glimpse of the Northern Lights is Uttakleiv, and many locals gather here to enjoy the spectacular views. 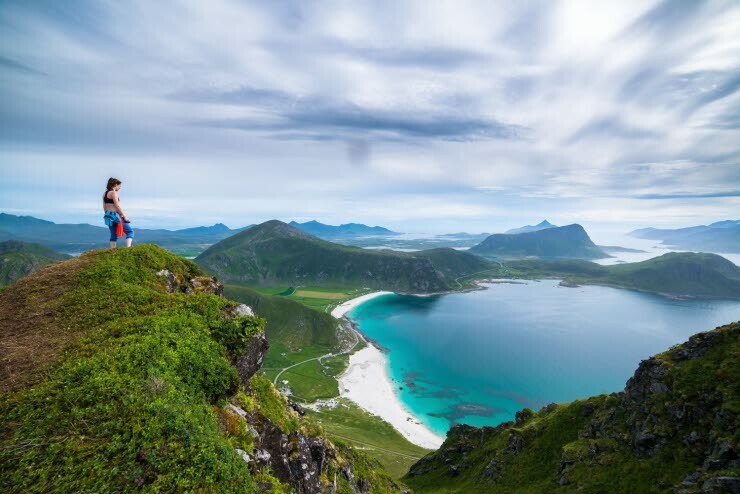 HAUKLAND BEACH: The views of Haukland from the top of Mannen are unforgettable. “Arctic Cod is synonymous with Lofoten. The best time for cod fishing is during the period January to April. The largest fish weighing 30-40 kg are caught from a boat, and if you don't have your own boat, there are plenty of boat rentals to choose from. There's honour and glory in cod fishing in the region. Lofotposten started a tradition 40 years ago, giving away a kilo of coffee to all fishermen who caught a cod weighing more than 30 kg during the Lofot season. That's where the name Kaffetorsk (Coffee cod) comes from. For added competitive spirit, the World Championship in Cod fishing is hosted in Svolvaer in March and is considered one of the largest fishing competitions in the world." If you wish to sample the cod without going fishing, Ivan recommends a visit to Anitas Sjømat on the Sakriss Island. "This place is ‘world famous’ for its homemade fish burgers and offers a great selection of fish and various seafood!" “Lofoten is often associated with mountain hiking, and one of the most magnificent hikes is Ryten, north of Kvalvika beach. There's no better place than this to watch the sun set in the ocean. Make sure that you bring a fully charged phone, because you'll take lots of photos here! The hike is about 5 to 8 hours, including the return. This is an amazing hike in the winter time." Note! Kvalvika beach, right below Ryten, is a very exposed area in Lofoten and we therefore recommend that visitors head to other beaches than this particular one.